Named for company partners Charles Deutsch and René Bonnet, Deutsch-Bonnet is one of many oddball 1950s French automakers, though perhaps my favorite of the bunch. The company made their stamp on the market by building tiny lightweight runabouts for Le Mans and Mille Miglia competition. By comparison to the racers they produced, the fiberglass-bodied, 1400 pound, Panhard-sourced-two-cylinder, 65-horsepower HBR5 shown here was the company’s Grand Touring model, intended for more luxury-minded mass-market appeal. Only about 430 of the standard HBR5 models were built across the production run from 1955 until 1961, making this an extraordinarily rare car. While these cars were hand assembled, and no two are exactly alike, the HBR5 is known to be only the second ‘series production’ automobile crafted with a fiberglass body (following Chevrolet’s Corvette, of course), which was provided by French coachbuilder Chausson. This particular DB was purchased from new by famed automotive designer Brooks Stevens, who retained the car for forty years of enthusiastic ownership. 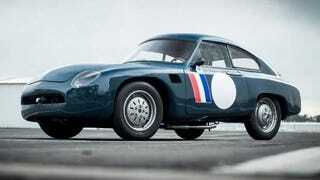 For, presumably, the hell of it, Stevens decided to enter his diminutive two-cylinder Grand Tourer in the 1957 running of the 12 hour race in Sebring, Florida. The car was piloted by Guy Storr and Hal Ullrich, though it failed to finish thanks to an engine issue after just 67 laps of competition. This strange Frenchie is exactly the kind of weird car I am known to fall in love with at a glance. The gorgeously worn-in red interior works perfectly with the exposed-weave fiberglass poids léger bodywork. The design is bulbous in places, but the back of the car is capped off with a nice quasi-aerodynamic half-assed ‘kammback’ that looks great. Compared to its contemporaries, it’s easily better looking than most of the cars the Brits were building, and only marginally worse than the average Porsche of the time. This car will be auctioned as lot #154 of Gooding & Company’s Scottsdale sale 0n January 19th and 20th. For more photos and history, check out the full listing here.